Daryan Villegas is the twenty-year old daughter of Olivia Villegas – Listen & Reynaldo Villegas. 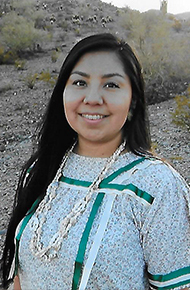 She is a member of the Tohono O’odham Nation and resides in Tucson, AZ. Daryan is a Sunnyside High School graduate and is looking to continue her education at Pima Community College where she will major in Psychology. Daryan enjoys playing volleyball and learning the history of what occurred in each decade. She loves meeting new people and seeing where she can best serve helping in her community. She states, “My personal goal is be a better person for my community, provide for my family and be a role model. 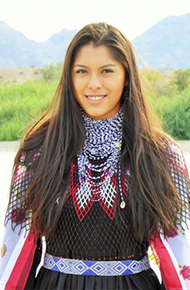 ”If selected as Miss Indian Arizona, Daryan plans to promote suicide awareness. Mariah Jordan Sharpe is the nineteen-year old daughter of Chaweka Fisher & Issac Sharpe. She is a member of the Colorado River Indian Tribes from Parker, AZ. Currently, Mariah is pursuing her Associate’s Degree in Biology with an emphasis in medicine & health and welfare at Paradise Valley Community College. Her goal is to continue her education at the University of Hawaii at Manoa and complete her Bachelor’s Degree and apply to Medical School. Some of Mariah’s interest & hobbies include traveling, paddle boarding on the Colorado River, golfing as well as learning traditional stories and songs from family & friends. Kaelie Mae Nash is the seventeen year old daughter of Shalenia Chee and Waylon Nash. 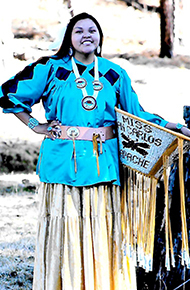 She is a member of the San Carlos Apache Tribe and lives in Peridot, Arizona. A 2017 High-school graduate of San Carlos High School, Kaelie is currently attending Grand Canyon University. She is seeking a Bachelor of the Arts degree in Environmental Science. Lexie Michael James is the twenty-one year old daughter of Jacqueline J. James. She is a member of the Hopi Tribe and resides in Polacca, Arizona. 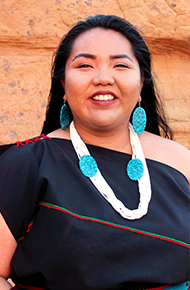 Lexie is currently employed as a Youth Liaison with the Hopi Foundation. She is also attending Northland Pioneer College where is she is concentrating on a degree in Law & Criminal Justice. She will then transfer to Arizona State University to complete her education. Lexie’s hobbies include reading and writing short stories and poems. She also enjoys weight lifting, learning more about her culture and language and spending time with the elderly. If selected as Miss Indian Arizona I plan to promote a healthy lifestyle among the state of Arizona, especially in our children. I hope to continue to work with my District in putting together another fun run and another color run that I started as my year as Miss Tohono O’odham Nation 1st Attendant. Harriett Chewing is the twenty-three year old daughter of Flora and Harry Chewing. 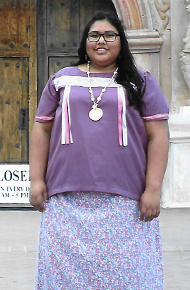 She is a member of the Tohono O’odham Nation and resides in Casa Grande, Arizona. Harriett is currently pursuing her Associate’s Degree in Nursing from Central Arizona College. She would like to become a registered nurse before becoming a pediatrician. Her hobbies include running, especially near the mountain that she lives by with her dog. Harriett also enjoys learning new songs on her flute. The Miss Indian Arizona Scholarship Program is sponsored by the Miss Indian Arizona Association (MIAA). The MIAA is composed of a variety of individuals, several of whom are past MIAZ title holders and participants. Membership in the organization is open to all interested individuals. In addition to members of the MIAA organization, the MIAZ Scholarship Program is made possible through the efforts of many volunteers in the community.